-- Vietnamese Prime Minister Nguyen Xuan Phuc arrived in Romania on Sunday for a three-day official visit. -- Temperatures are forecast to rise up to 38 degrees Celsius in southern Vietnam on Monday. -- Two elementary school students drowned on Sunday in the north-central province of Thanh Hoa on Sunday. 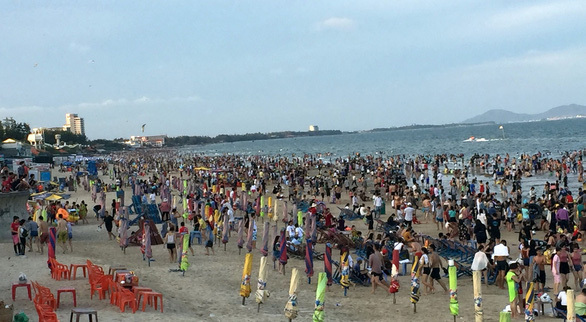 -- Tourists crowded the beach in Vung Tau, a resort city 120km from Ho Chi Minh City, on Sunday, when Vietnam enjoyed a national holiday – the Hung Kings’ Festival. -- Police have arrested five people suspected of transporting 26.6kg of illegal drugs from Cambodia into Vietnam. -- A group of young people from Ho Chi Minh City came to the Mekong Delta city of Can Tho on Sunday to join hands with local students in cleaning up a festival dedicated to traditional cakes and dishes in order to raise awareness of environmental protection. -- British authorities have charged four people with human trafficking after 29 Vietnamese were found in a van pulled over by police in the UK on Friday last week.